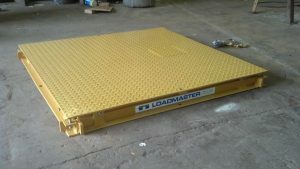 Low profile industrial floor scale platforms have applications in weigh counting, meat processing, air cargo, shipping and receiving, process control and miscellaneous check-weighing just to name a few. Loading floor scale accomplished via hand truck, forklift and/or overhead crane. (1,000 lb load cells) 2' – 4' 2' – 4' 4"
(2,000 lb load cells) 3' – 6' 3' – 6' 4"
(4,000 lb load cells) 4' – 8' 4' – 8' 4"
(10,000 lb load cells) 5' – 8' 5' – 8' 5.25"
9' – 10' 7' – 8' 6"
(15,000 lb load cells) 6' – 8' 6' – 8' 5.25"
9' – 12' 7' – 12' 6"
(20,000 lb load cells) 6' – 12' 6' – 12' 8"